Fall and winter in Utah means different things to different people and different kinds of athletes. As an endurance coach, many of my athletes have finished a long season of cycling, or have peaked for and competed in events over the spring and summer months. Some enter fall well prepared to compete in cyclocross and track events, while others need to back off training and even take well deserved down time. For many cyclists, October is traditionally a month of reduced training intensity and often an opportunity to take a well timed block of rest, with November representing the first month of their annual focused training program. In Utah in particular, there are countless enjoyable activities for runners, mountain bikers, road cyclists and triathletes seeking to “mix things up.” Mixing it up is not only an excellent and important way to avoid repetitive stress and overuse injuries, it also represents what can prove crucial mental breaks from narrowly focused sports and competitive activities. Early on in my coaching career, I was impressed with how beneficial running was to my triathletes’ cycling. And in working with physical therapists, we determined that running was an important way to encourage balance and facilitate the rehabilitation process in cyclists recovering from injuries, and snowboarders trying to regain symmetry in strength and movement. Downhill skiing has always been one of my favorite ways to strength/cross-train for cycling, and I’ve found snowboarding beneficial to promote better balance, torsional strength and stabilizer muscles development. I like to snowboard both regular and goofy – again, to promote symmetry. Running, especially trail running, and downhill winter sports also bring to the table what running does for cyclists: the valuable dimension of lateral and stabilization conditioning, combined with some level of impact. The very low impact characteristic of road cycling, in particular, represents both its greatest attribute biggest shortcoming. Our bones crave at least some level of impact, along with bipedal weight-bearing activities. To state the obvious, road cycling greatly builds lower body strength, often causing the enthusiast to neglect or completely ignore her or his upper body, missing out on important – and aesthetic – complete-body conditioning. This is where cross-country skiing, and related sports like snowshoeing and backcountry skiing, can help cyclists take their off and pre-season training to a whole new level of full/whole body conditioning. Former biathlon Olympian and one of Utah’s cross-country skiing treasures is my dear friend and early mentor Laurie Grover Humbert. Laurie helped me develop as both an aspiring competitive cyclist, as well as a cross-country marathon racer. Over the past couple of winters, Laurie and I have increased our efforts to encourage cyclists to make the transition – once the snow falls – to cross-country classic and skate skiing. Both are excellent full/whole body activities, and both can help individuals progress and succeed as cyclists. Cross-country skiing can serve as a valuable activity in which to build an aerobic foundation for the coming cycling season, and it can likewise serve as an additional competitive and/or high-intensity training cycle. Like any other off or pre-season activity, it should be carefully implemented in order to ensure that it is complementary to whatever other athletic discipline an individual is targeting. Cross-country skiing is a great way to “get ripped” and improve the tone and appearance of the abdominal muscles. 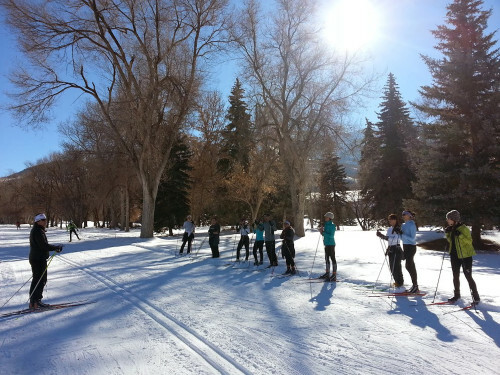 Both classic and skate skiing work and can drastically improve your core muscles while you enjoy the beautiful Utah (and nearby Idaho and Wyoming) outdoors. Cross-country skiing is also truly enjoyable and challenging. Even downhill skiers must adapt to skinny skis, devoid of metal edges, fixed heels and stiff boots. It is a technical, rhythmic sport that requires balance, dynamic movement, timing, and repetitive precision. It can prove taxing (due to inefficient movement and technique) and even discouraging at first, then increasingly exhilarating as it all comes together. Nordic track, telemark and backcountry (including Alpine Touring/Randonée) skiing can help dedicated cyclists not only take advantage of “harsher” Utah winters, these activities can often prove as enjoyable. Add to the list of benefits the ability to escape the many days of inversion each winter along the Wasatch Front, and you now have plenty of reasons to take up these disciplines as ideal cross-training for both body and mind. Finally, another reason that, for Utahns in particular, cross-country skiing is a great winter sports diversion, is the abundance of groomed trails now within a short drive. Cross-country skiers can squeeze in a good ski during the lunch break, or sneak out 2-3 times per week a little early from work to ski at twilight – one of my favorite times of the day to glide along trails and enjoy the Abendrot. However you choose to get into it, you will love it and get fit. Enjoy! Laurie and I hold several cross-country ski clinics between Thanksgiving and the end of the Nordic track season (due to lack of snow). You can “Like” and watch for postings on the Leadout Endurance Coaching Facebook page (www.facebook.com/LeadoutCoaching), or call an excellent shop like Wild Rose Mountain Sports (702 3rd Ave, SLC 84103 – Tel. 801-533-8671) for information on skate ski/boot/pole packages, specially discounted in conjunction with the Leadout Endurance Coaching clinics. Mark Deterline is a top endurance coach operating in Utah and Northern California (www.2thefront.com). 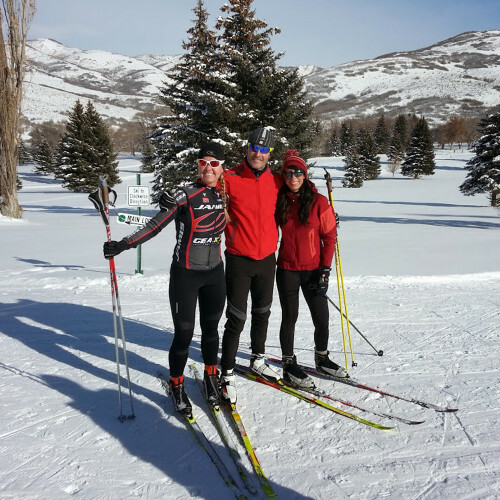 A certified Nordic ski instructor, Mark has worked closely with Sam Palmatier of Sundance Nordic Center and Laurie Grover Humbert of the Mountain Dell development programs to promote Nordic skiing and the advancement of athletes of all backgrounds. Mark has been racing bicycles at the elite level for many years and loves to talk up Laurie as one of his early cycling and XC ski racing mentors. Laurie is a former biathlon Olympian and national level bike racer, and an inspiring breast cancer survivor. “Like” Leadout Endurance Coaching on Facebook for ski clinic dates, times, locations and ski rental packages (via Wild Rose Sports www.wildrosesports.com) this winter.